Catherine Pluygers was born in Colchester in 1955. She studied oboe with Peter Graeme, Edwin Roxburgh and Terence McDonagh at the Royal College of Music and with Ray Still at the Banff Centre of Fine Arts, Canada. She has a Bachelor of Music (honours) and a Master Degree from the University of London as well as winning awards from the Worshipful Company of Musicians, British Federation of University Women and the Gulbenkian Foundation. She started out as a teacher for the ILEA and as an orchestral musician working for the BBC, Sadler's Wells, Royal Ballet etc. and then has gone on to have a very varied career in the music world as soloist, teacher, concert promoter and composer. She was the founder member of 'Thomas Arne Players' which gave its debut in the Purcell Room in 1980 and Wigmore Hall the following year. As a soloist she has toured widely in Britain with a particular interest in music for oboe and organ, contemporary music and improvised music and has premiered Sonata No 2 for Oboe and Piano by Ruth Gipps which was written for her. 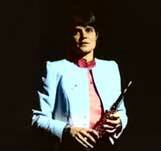 In 1985 she formed the New Wind Symphony Orchestra and New Wind Summer School. New Wind Symphony Orchestra gave its debut in the Queen Elizabeth Hall and worked in London and SE England until 1995. It specialised in wind symphonic and wind chamber music and has been funded by the Sport and Arts Foundation and was a winner of the International Theatre Company (ITC) award. This work has led to first performances and revivals of music by composers such as Grainger, Alkan etc. And in Denmark, USA, Hong Kong, Syria and Spain. Recordings include 'English Music for Oboe and Piano' with Matthew Stanley broadcast on the BBC, Australian and Danish Radio and a CD of Music by Ray Parfrey recorded in 1996 with Richard Deering. She is currently promoting 'Music for Solo Oboe by Women Composers' and is touring this work at universities and festivals in the ULK and in USA. She has also recently been engaged on solo foreign tours namely in USA, Hong Kong and India. In April 2005 she was the first solo oboist and first person to present contemporary music in the April Spring Friendship Festival in Pyonyang, North Korea. In 1998 she started London New Wind Festival now in its 11th year - a small festival designed to promote contemporary music written for wind players supported by the Hinrichsen Foundation, Holst Foundation and the Performing Rights Society. She is in the Who's Who.